What can’t your E71 live without? We all get our phones with default applications installed by Nokia or some 3rd party partners. We all then have Real Player, Sports Tracker or bar code reader in it. However, the power of Symbian, as a real operating system, is that you can quickly and easily add applications which make the phone customized for your needs. This week I have read an interesting article about top ten freeware applications for N82 posted on the Nokia N82 blog. It prompted me to take a look at my E71 after a few months of usage and check what I installed. What are the apps I can’t live without? Because of hardware disparities such as lack of built-in accelerometer, the top ten for E71 will be different. You won’t find ShakeLock on my mobile. Due to compatibility differences, you won’t see me playing any of N-Gage games either. 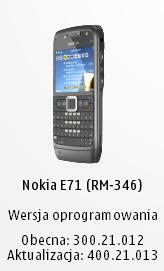 However, E71 with its full keyboard is open for other possibilities. That’s why you can see me in a bus chatting with Nimbuzz instead of texting. I have Gmail and as well as WidSets on my phone, but I definitely wouldn’t put those programs in my personal top ten. OK, so I’ve created my own E71 top ten, not only freeware apps. Now, some comments from my side. As you may see, I took into consideration default applications but I didn’t t include native calendar, alarm clock or e-mail application as those really are a must be in a modern phone. Anyway I’m interested if you use other software instead of those original features. For example Nokia Email or Microsoft Exchange? I’m very curious which of those applications you use as well. Actually I hope you will post your own favs or even top tens in here! I believe this could help all of us customize our phones by finding yet unknown applications lost in constellations of Symbian software.